Arsenic, a deadly poison, kills by blocking the ability of cells to produce and consume energy. 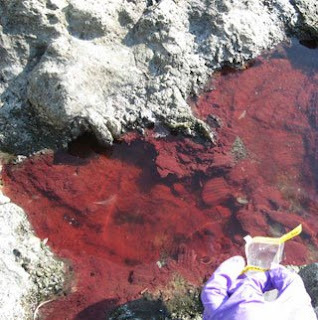 Yet, some red and green slime mats in briny hot springs in Mono Lake, Calif., use the potent compound rather than water to carry energy during photosynthesis (the process used by bacteria and plants that converts sunlight into food) new research in Science reveals. The newly discovered microbes steal two electrons from the arsenic in the spring water, turning it into so-called arsenate, and use the energy to transform carbon dioxide into food. This only happens in the presence of light, which provides the energy to initiate the process, according to microbiologist Ronald Oremland of the U.S. Geological Survey, who led the discovery. These are not the only bacteria that use poison to make food: They are from the genus Ectothiorhodospira, which largely relies on another poison, toxic hydrogen sulfide, for the same purpose. By analyzing the genetic material of the microbe, the researchers have also determined that this is a primitive process, going back at least three billion years, according to Oremland. That could mean that arsenic-based photosynthesis predates the oxygen-producing variety that enables life as we know it. Not everyone agrees. "I don't think this is an ancient organism that predated most purple bacteria but something that evolved after purple sulfur bacteria already existed," says molecular biologist Donald Bryant of Pennsylvania State University in University Park, who reviewed the paper for Science, speaking of the new bacteria's ancient relativesthat are thought to have evolved earlier. "It is an interesting case in which nature has taken something that is normally quite toxic and made good use of it for growth."